Please be sure to check out Part One, Part Two, Part Three, Part Four, Part Five, Part Six, Part Seven, Part Eight, Part Nine of Yamakoshi Autumn 2011. 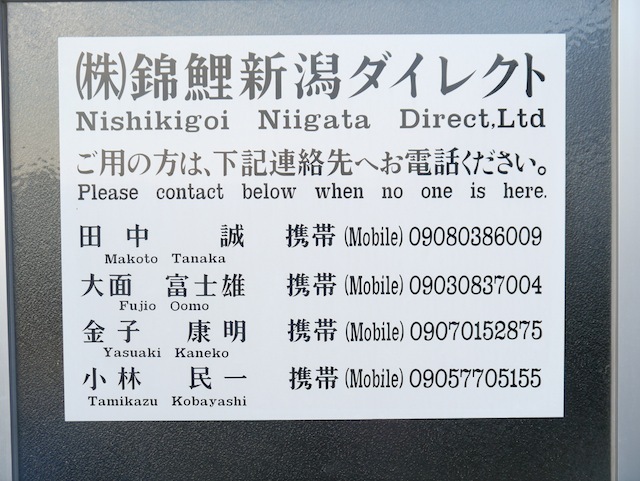 The Nishikigoi Niigata Direct (NND) outlet was originally formed some years ago by Fujio Oomo owner of Oomo Koi farm, Makoto Tanaka from Marusyo Koi farm and Yasuaki Kaneko from Kaneko Koi farm. This year the company has expanded with a brand new large facility close to route 17 between Nagaoka and Ojiya and have also added a new member of staff Tamikazu Kobayashi mainly to handle the paperwork side of the business. Because Fujio speaks perfect English, and after he’d got over the shock of seeing me back in Yamakoshi, I asked him if he’d let me conduct an interview with him and also let the others in the party listen in. He readily agreed and a date and time was arranged, this gave me some time to think of questions I’d like to ask him. I first met Fujio in ’93 in Nagaoka where he owned a very high class Kimono and accessory store at a prime location on the main street. He had lived in Nagaoka all his life, only a short drive to Yamakoshi but rarely visited the area although he mentioned he did like Koi and kept some in small ponds on the rooftop of his store. Fujio seemed genuinely amazed to learn that I had visited Nagaoka for so many years to find Koi and ship them home for re-sale. 1993 was also the first year (of many to follow) that Dennis Wordsworth came to Japan with me so it was necessary for me to teach Dennis the routes to take to all the breeders in and around Yamakoshi. Fujio made it a point to come to Nomole with us almost every evening and found it fascinating that I knew the surrounding areas so well. 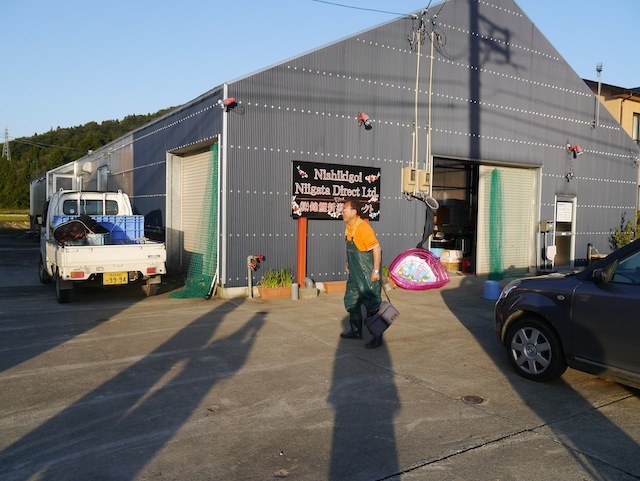 On one of those evenings I mentioned we had to make an early start the next day to select 100 nisai Kohaku from Hasegawa in Ojiya. Fujio was fascinated and asked if he could come along with us to see what was involved. The three of us arrived at the Hasegawa home early the next day and it was obvious that Fujio had no idea where he actually was and the small facility had no signs to let anyone know there were Koi for sale there. I had been buying Koi from Hasegawa since 1982 so I knew the ropes and also the care needed to find the 100 best patterns from around 4,000 nisai in a very tiny pond without damaging any other Koi. It’s a slow business requiring much patience; the Koi selected were placed in a blue bowl and after five had been selected they were checked once more and then photographed before taking them to another pond to await shipping. Fujio was visibly shocked when he saw so many Koi in such a tiny pond and started asking questions such as ‘Why did you select this one, I’d like to learn’? By the end of the day we had our 100 nisai Kohaku in the other pond when Fujio mentioned he would like to buy one of them from me. I told him that he’d been a great help that day so I would let him select one at no charge. He thanked me profusely but mentioned he had no idea which one to select and asked us for some assistance. I explained to him that in the pond there were 100 nisai Kohaku, one was the best, one was the worst and the others all had a place somewhere between but he should select the one he liked the most. If I recall correctly the three of us stood there until the light began to fade discussing the finer points of Kohaku appreciation. In the end Dennis recommended one to him and Mr. Hasegawa packed it for him to take to his home. On the way home Fujio asked if he had the best one, I just shook my head. We’d spend all October and November finding Koi in the area and in spring spend all April locating tosai. When we returned in spring ’94 Fujio announced that his ‘Koi teacher’ Shoji Tanaka of Marusyo in Yomogihira had built (at Fujio’s cost) a pond at Marusyo specially for Fujio’s personal collection of Koi. I found it hard to understand that even in 1994 Fujio still had not paid visits to other Koi farms that were all around him. On one occasion (late ’95?) I asked him to come with us all the way to Isawa in order to translate an interview I’d arranged with Toshio Sakai. He looked at me as if to say – ‘Is it true, you also know Toshio Sakai’? By 1997 there were many guests accompanying us and some were buying Koi at prices Fujio could not believe, he’d follow us around on some days and our visitors took to him readily. Fujio has a bubbly personality as well as a very good sense of humour and a genuine desire to assist if needed. As an aside here, his name is pronounced O-O-mo not who-mo. One of his famous lines is – ‘My name is Fujio O-O-mo but I am NOT one of them’! I think it was around 1996 when he first started to guide foreign Koi visitors around the area and in 1997 he mentioned that he was looking for land to build a Koi farm on as he wished to become a Showa breeder! 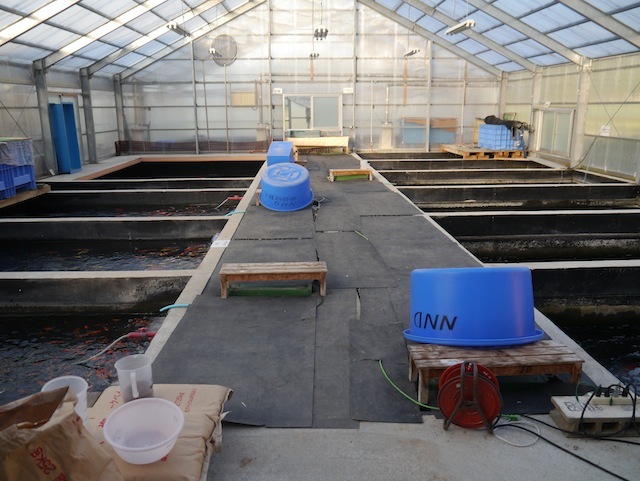 At first I thought he was joking, I asked – ‘Do you realise how many fine Showa breeders are in Yamakoshi, do you know how much time you will have to spend at the Koi farm’? No, Fujio wasn’t joking and by then he knew just about every breeder in Yamakoshi who all needed him from time to time to translate for them. 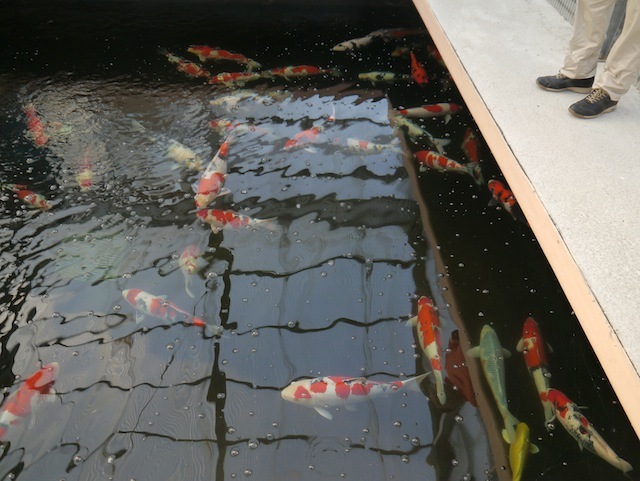 In 1998 Fujio opened ‘The Oomo Koi Farm’ on some land he’d bought near to the Nogami Koi Farm. Hisayaku Nogami then became Fujio’s next Koi teacher and advised Fujio to breed only Showa initially as they would take much less time to cull. 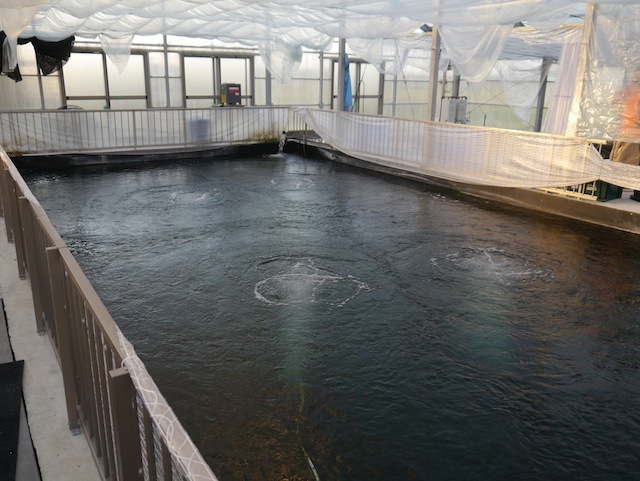 Fujio’s experiences in breeding Koi escalated with Hisayaku’s expertise and together with his own enthusiasm and income earned from his growing overseas customer base his business became very profitable. In 2003 he formed NND with the assistance of Makoto and Yasuaki and now this has expanded to what we see today.